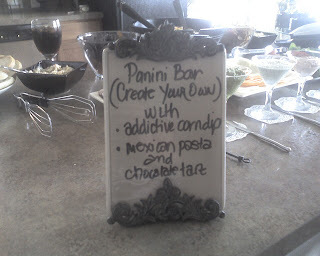 On Saturday, we kicked off our "Captivating" bible study (a.k.a book club) with a Panini Bar lunch. Breads included plain sourdough, rosemary sourdough, millet, and ciabatta. 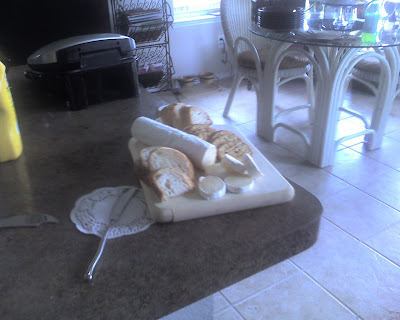 Cheeses to choose from were mozzarella, baby swiss, cheddar, brie, and pepper jack. Sauces - pesto, blue cheese, love dip, green garlic dip, southwest chipotle, and balsamic vinaigrette. Everyone had a blast making their own creation. My little George Forman grill made the perfect panini grill marks. 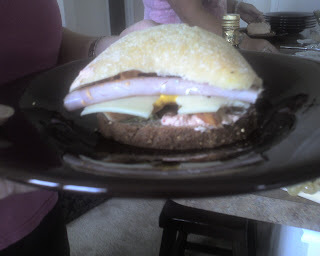 Our friend, Terry - can't decide what she wants on her sandwich, so she puts a little of everything. Yes, that's ciabatta on top with the millet bread on the bottom. She loves it because every bite is a different experience. A direct quote from Terry: "What can I say????? It was great - 5 different dressings, 2 different kinds of cheese, meat and bread, plus spinach and tomatoes. I highly recommend it. " This was the best find ever.... a President brand BRIE log - I got this at Walmart of all places.. and people loved it. There was just a little bit left. Please note the small George Foreman grill in the background. Again, it deserves high praise. It cooked all of our panini's fabulously. My friend, Jen, aka former Tater Hater, shared this blog with me. So , next to Jen's blog, this is my new favorite. Bossy is hilarious. I think Jen and I can learn alot about blogging from Bossy. This is a young boy who is a great speaker. Wow. I think this kid will be President of the United States of America someday. Ok.... so my son had gotten his hair cut (he is a Senior at Texas Tech). He had pictures on Facebook, so he told me to get an account so I could see. So I did. I was very leary about it, but didn't hesitate at all to start searching for anyone I could think of. (Is that considered stalking?) I found Monica, my friend from college back in 84-85. I found Preston - a guy I used to work with in 98-00. I'm linked to the high school 25 year reunion photos. First, blogging, now Facebook. What next? Ok.. I chickened out and didn't go. In all honesty, it was raining, and once I got back from the gym on Saturday, I hunkered down and didn't leave the house. (Ok, I had really made the decision about 2 weeks ago that I was not going. I have not seen these people in 20 years, and I was not going by myself. ). The pictures are posted on Facebook, and I am happy with my decision. The people I wanted to see weren't there. I just wasn't feeling as savvy and sophisicated to go by myself. (Ewww... flashback to the Chicago Thai restaurant incident). She will be on Ellen Degeneres on Wednesday, Sept. 17th. Update : She was on. Apparently, she got the story from a dream. She had never written and after submitting her story to 15 agents, which 9 rejected (aren't they regretting that now- 5 books later and a movie).. 5 didn't respond.. and only one did.. the one that she still has today. I was leary when I started reading "Twilight". I didn't know if I'd be interested in a story about teenagers. Wow.. I was hooked. Great story. A different take on vampires. Can't wait for the movie. Apparently, this movie was the #1 movie over the weekend. I am glad that I saw it but I do not highly recommend it. For those who are big Coen Bros fans, it's probably worth seeing it at the theater. Otherwise, it's a renter for sure. Brad Pitt is funny. Cowboys ROCK!! What a great game. I was a little nervous when Tony fumbled, but I knew he'd keep his head in the game. This is going to be a GREAT season. Go Marion the Barbarian.. who is my favorite. I am in search of a pink jersey with # 24 on it.